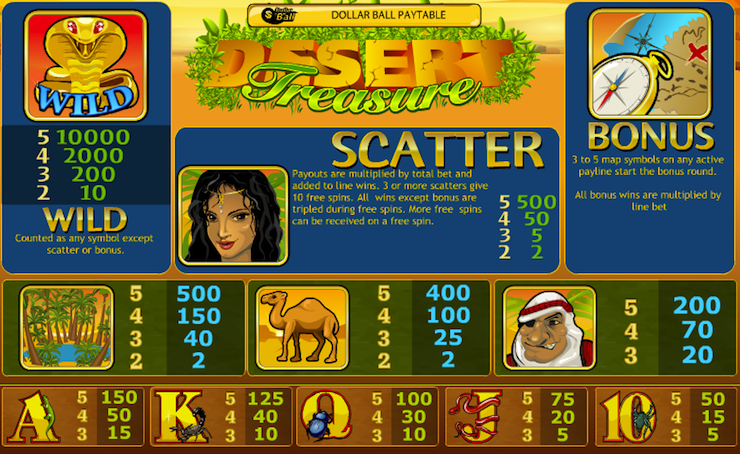 Desert Treasure is a 5 reel 20 payline multi-coin video slot game that has been developed by Playtech. This game, as the name suggests, has an Arabian Desert theme that is brought to life by some amazing graphics and a wonderful soundtrack. Desert Treasure has 8 symbols on the reel with a Scatter symbol, Wild symbol, a Free Spin Bonus Round and a Bonus Feature game where you get to pick a prize. The Scatter symbol - Princess, can be scattered anywhere on the reels and fetch wonderful winnings; while the Gold Snake - Wild symbol, can be used as a substitute for any winning combinations except the Scatter and Bonus symbols. You have the choice to bet on single lines or to activate all the paylines by clicking on Bet Max. Just remember, a winning combination on the online slot runs only from left to right and must always be played on active paylines. Now all you need to do is to activate a higher payline, spin the reels and pull that combination of winning symbols. There are also separate payouts for getting multiple Wild, Scatter or Bonus symbols in an active payline. For example, three or more Scatter symbols will get you 10 free spins where you triple all your winnings. If you pull three or more Bonus symbols in the active payline, you get a Bonus round with as many prizes as Bonus symbols.